ADDENDUM: 358 is the correct Lot number; catalog is incorrect and says Lot 357. 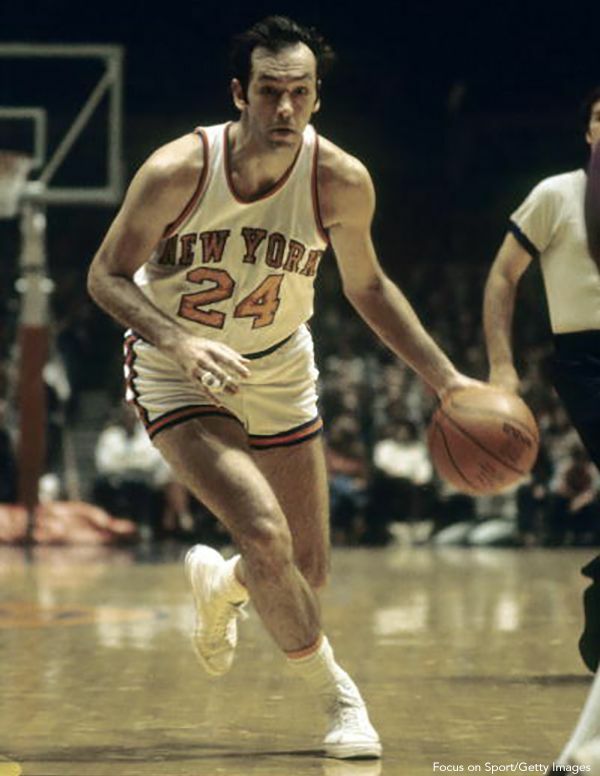 Long before he was a New Jersey State Senator, Bill Bradley was an accomplished NCAA basketball star at Princeton University who was drafted with a territorial pick in the 1965 NBA Draft by the New York Knicks. A Rhodes scholarship to attend Oxford University delayed Bradley’s impending arrival at Madison Square Garden for two more years. 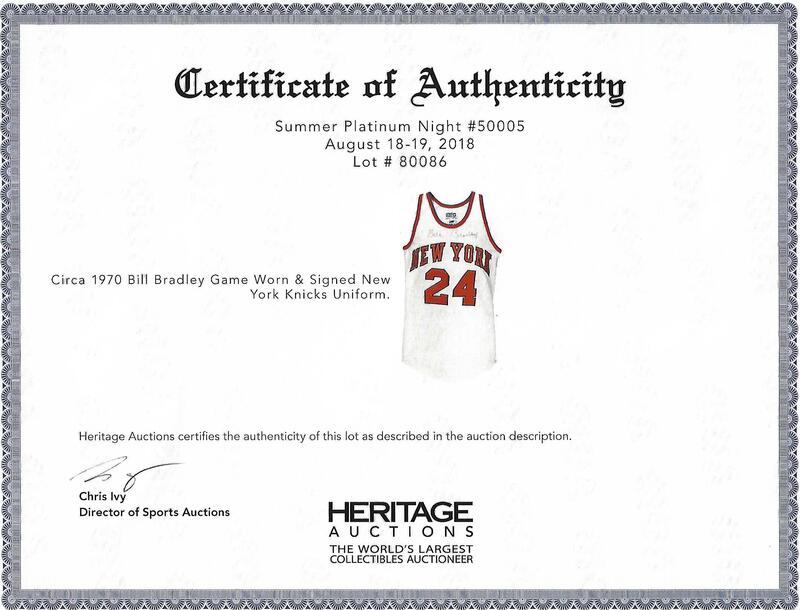 And in 1970 – just three years after his 1967 debut in the Knicks’ blue and orange color scheme – Bradley and fellow future Hall of Famers Willis Reed, Walt Frazier and Dave DeBusschere teamed to win the franchise’s first NBA Championship in history defeated an equally talented Los Angeles Lakers squad (led by Chamberlain, West & Baylor) in seven games. The 6’5” Bradley then helped lead the Knicks to their second title at the conlclusion of the 1972-73 season, again over the Lakers. 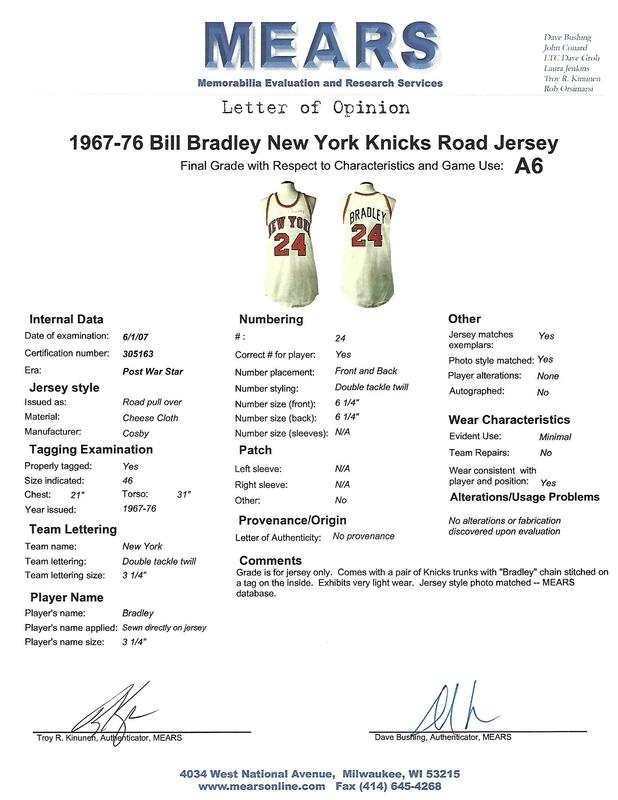 The Knicks uniform presented here is likely the combo jersey and shorts Bradley wore during one or both of those early 1970’s championship runs. The home white cheesecloth jersey exhibits the light wear one might expect from playoff-only action. The orange and blue tackle twill reads "New York” and “24" across the chest, giving way to "Bradley” (in only blue tackle twill lettering) and “24" applied in similar fashion to the back. 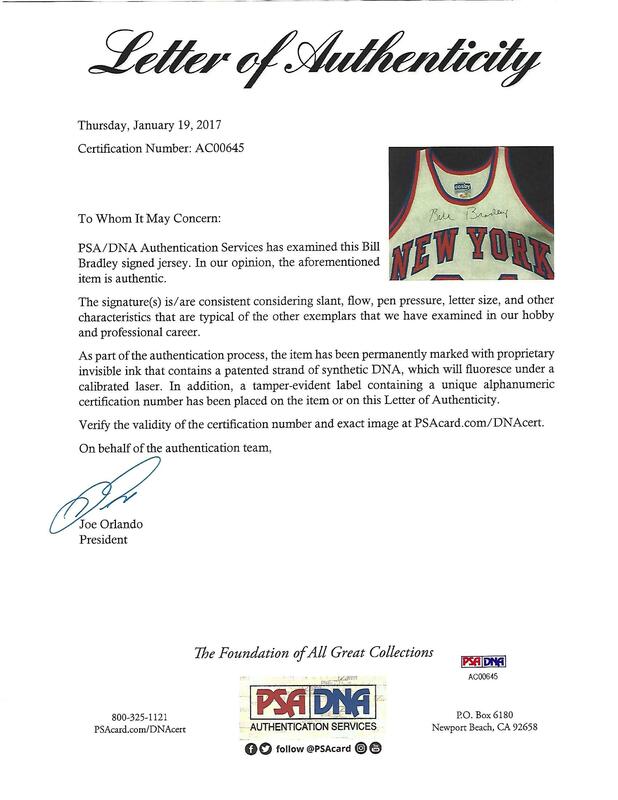 The interior collar sports the proper "Gerry Cosby" manufacturer's label with secondary tags reporting size "46," "Union Made" and complete washing instructions. Bradley’s black sharpie signature graces the upper chest area and would rank 9/10 in our book. The matching white trunks have an embroidered "Bradley" swatch applied to the interior waistband, right beside "Cosby [size] 36" labeling. 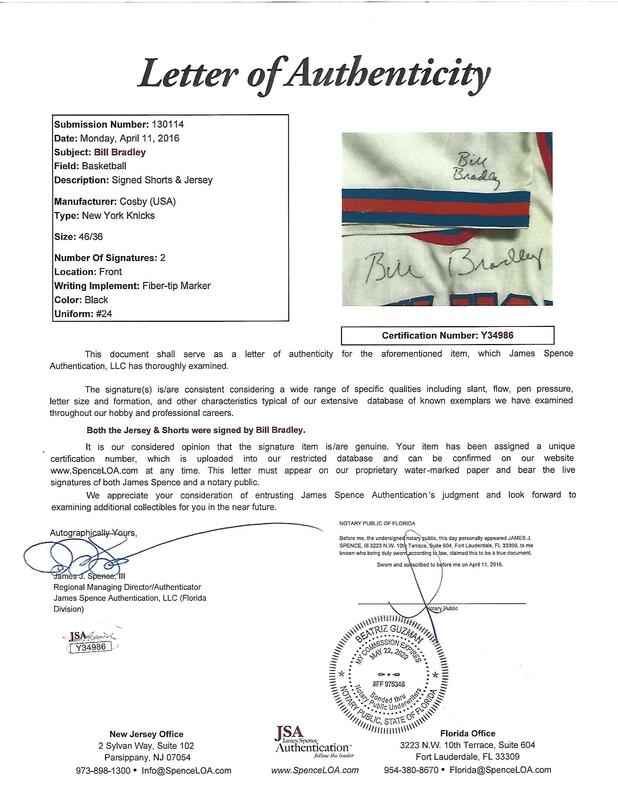 Another black sharpie signature from Bradley appears on the front of the shorts, just above the lower left front trim. 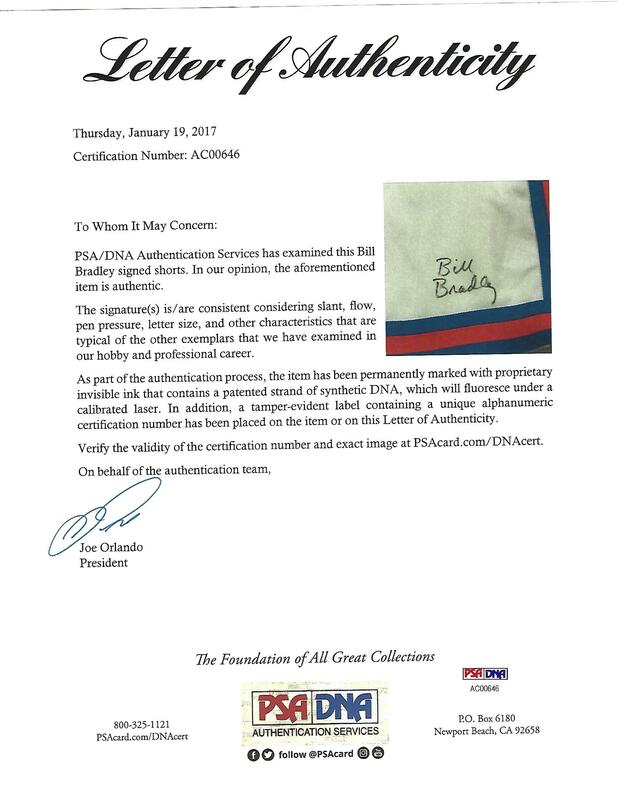 The jersey has been assessed at an A6 level by MEARS, the shorts simply "Authentic" as per the service's guidelines. Includes letter from MEARS (graded A6). Full LOA's from PSA/DNA and JSA for the autographs. 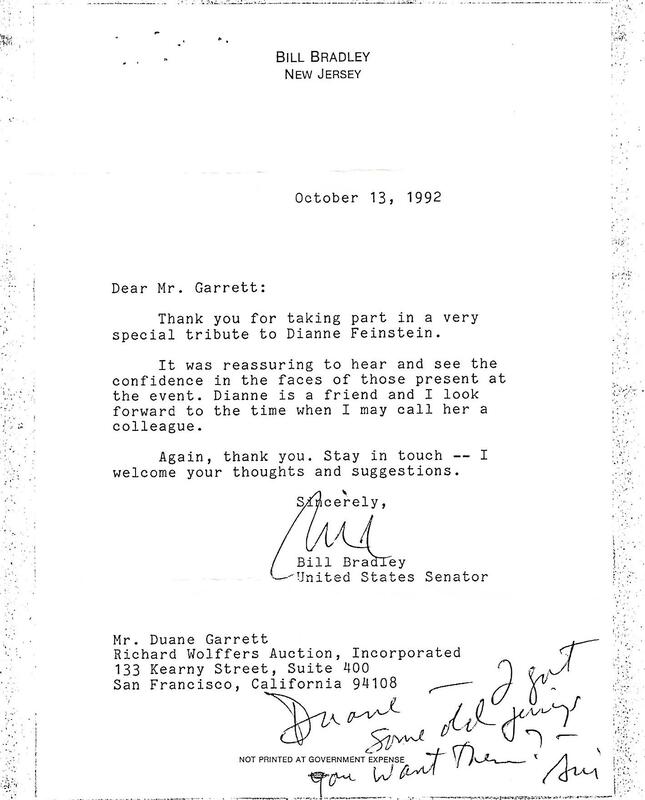 Additional provenance provided via a 1992 copy of a letter from Senator Bradley to the former campaign manager for Diane Feinstein, who was a longtime Bay Area sports collector.